Brian and Maria Schulz during their washroom wedding. On January 2, Brian Schulz and Maria Schulz got married inside a washroom at the Monmouth County Courthouse in the US. This, of course, was never their original plan - but things took a surprising turn for the young couple when the groom's mother had trouble breathing and had to be administered oxygen in the ladies bathroom. "We were sitting outside of the court room and waiting to go in and my mom gives me a call and says she's having trouble breathing," Brian told The New York Post on Thursday. He found his mother in the washroom, pale, sweating profusely and unable to talk. Officers from the Monmouth County Sheriff's Office tended to Brian's mother and administered oxygen to her. 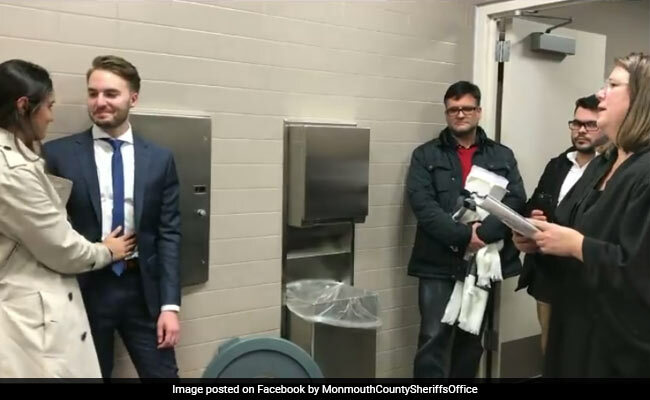 "The couple was clearly upset about the mom and having to postpone their wedding in which they would have to wait another 45 days for a new marriage license to be processed," wrote Monmouth County Sheriff's Office on Facebook. Since officers did not want to move Brian's mom from the washroom, they decided to bring the wedding to her. Judge Katie Gummer agreed to the venue change and presided over the 'rather unusual' ceremony. On Facebook, the video has been viewed over 10,000 times since it was first shared on January 25. In further good news, the mom is now doing well.